Javelin Strategy & Research is a consulting firm located in New York city and one that releases an annual check-up on the various credit card companies and their security efforts in place to protect consumers. The good news is there are a few credit card companies with impressive measures in place. The bad news is the report suggests they’re all lacking to some degree. Not only that, but adding those extra securities is as easy as “taking a few simple steps,” which has some asking, ‘why hasn’t it already been done?’. So which companies ranked best and what are those “simple steps”? The scoring efforts include a maximum of 45 points for any credit card company’s prevention efforts in place at the time of the survey, 35 points for its ability to detect fraudulent activity and 20 points for its ability to resolve those problems once they were found. The average score of the top 10 was 59. Using a range of numbers between 1 and 100, with 1 being the lowest rank and 100 being top ranked, the firm awarded Bank of America with 87 points, putting it at the top of the list. Last year, it was ranked number three coming in behind American Express and JPMorgan Chase. Coming in at number two this year is Discover. In recent months, Discover has made several changes to its consumer protection efforts and it’s clearly paid off. Last year had Discover at number six, a definite improvement. Wells Fargo and CitiBank tied for the number 9 position. Last year, CitiBank claimed the number 4 spot and dropped five points this year while Wells Fargo came in at number 8 last year. Claiming the number 8 spot was HSBC, up one spot from last year’s number 9 ranking. The study revealed that all the credit card companies do exceptionally well resolving problems when they’re discovered. The average was 18 points (out of a possible 20 points). The problem, says the report, is the efforts in preventing problems from occurring in the first place. The average was 17 (out of a possible 35). 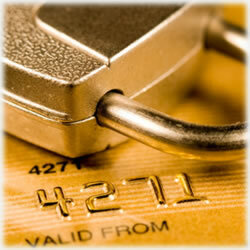 On average, the fraud totals for all top ten credit cards equates to around $37 billion. While no one wants to know their credit card company falls even a little short when it comes to protecting their customers, the truth is, today’s cyber thief is quite savvy when it comes to hacking into a network. Still, there were some rather simple recommendations made that might become new policy for your credit card carrier. One of those recommendations is by providing text alerts anytime a credit card is used. It was also suggested that anytime a purchase is made online or over the telephone, the customer be contacted to verify the purchase is legitimate. A final recommendation includes limiting a customer’s online access to his account if his anti-virus software on his computer or mobile device is not current and up to date. So what do you do if you want more specific information on your credit card carrier? Call it. Customer service representatives will be able to provide clearer guidance as well as answers as to what they’re doing to protect you.